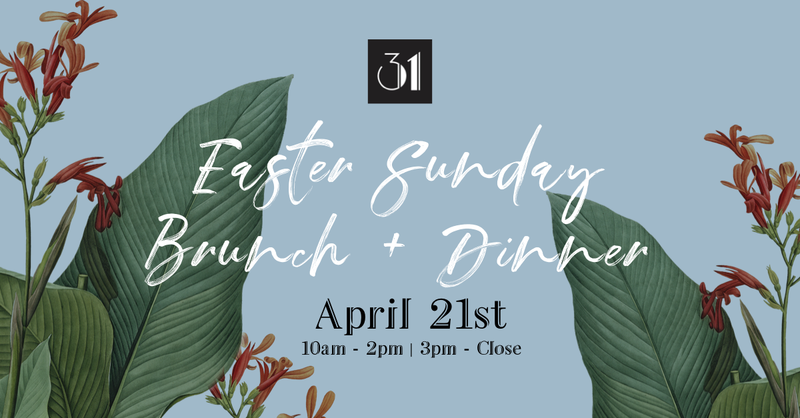 Join 31 Supper Club this Easter Sunday, April 21 as they open their doors for a Special 31 Sunday Brunch and Easter Dinner! Sunday Brunch will include favored classics like Crab or Salmon Eggs Benedict, Ham & Spinach Frittata; and French Toast with 31 Supper Club flare! Starting as early as 3:00 p.m. enjoy Easter Dinner Specials such as Duck Confit, Lamb Cedar, and Plank Salmon + 20% off bottles of wine. All this and more –including dessert specials! For more details, call 386-275-1635 and book your reservations today. 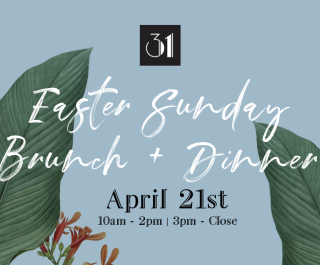 Join us this Easter Sunday, April 21st as we open our doors for a Special 31 Sunday Brunch and Easter Dinner! Sunday Brunch will include favored classics like Crab or Salmon Eggs Benedict, Ham & Spinach Frittata; and French Toast with 31 Supper Club flare! Starting as early as 3:00pm enjoy Easter Dinner Specials such as Duck Confit, Lamb Cedar, and Plank Salmon + 20% OFF Bottles of Wine! All this and more –including DESSERT SPECIALS! For more details call 386.275.1635 and book your reservations today!